Twitter is all about following and interacting with your favorite personalities and famous figures. Often it happens that we go on following numerous accounts that possess some catchy words to attract more and more followers and we all together end up by following even some inactive users. It’s good to stay systematic; and this also applies to your virtual social world. Naturally, it is of no use to simply follow the inactive twitter users as they won’t be sharing any content or updates with its’ followers. This will just fill up the empty space of your follow list. 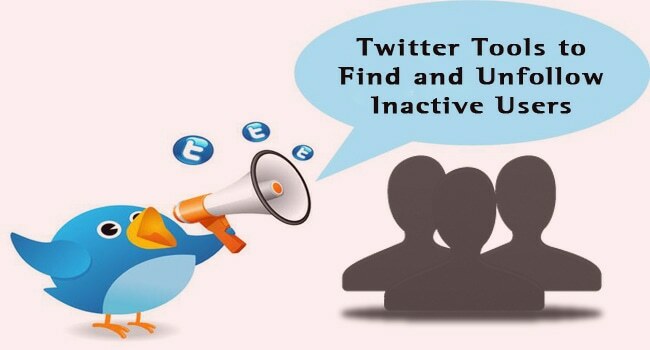 Hence, to ease your process of managing the unfollowing inactive twitter users, we bring up beneficial information about tools that will find those inactive users so that you can unfollow them as per your wish. Note: The inactive users that I will be mentioning are restricted to twitter inactive users only. 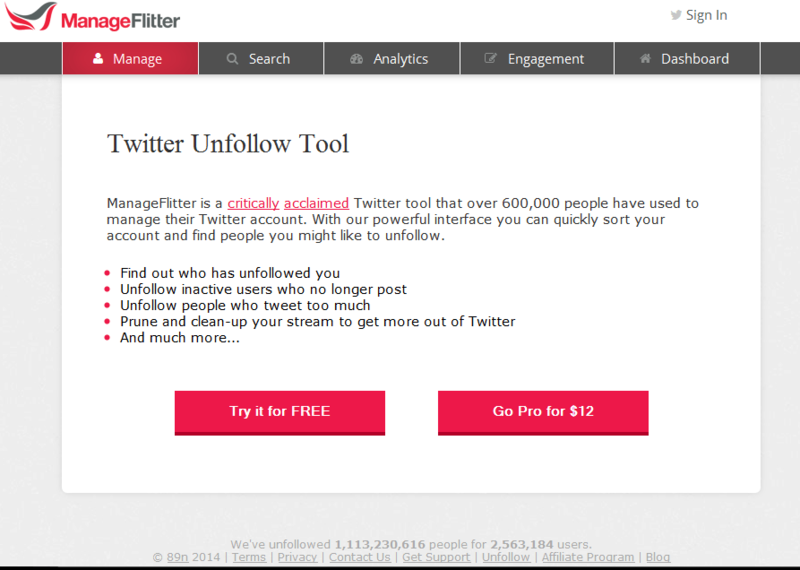 ManageFlitter is a popularly and widely used twitter tool to manage the twitter accounts. This is loved by twitter users as it is a complete management tool for managing twitter account. As you can see in the above figure, you can take a trial for free. Click on the Manage option and select ‘Unfollow’ from the drop-down menu. 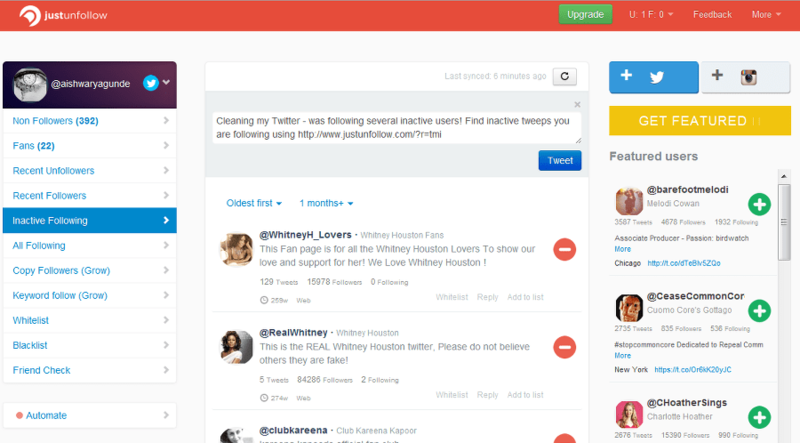 You will then notice several categories on the left-hand side bar such as ‘Not Following Back’, ‘Non-English’, ‘Inactive’, etc. As we are looking forward to unfollow the inactive users, click on ‘Inactive’. It primarily displays the quantity of twitter accounts that have not posted since last 30 days at the header part. 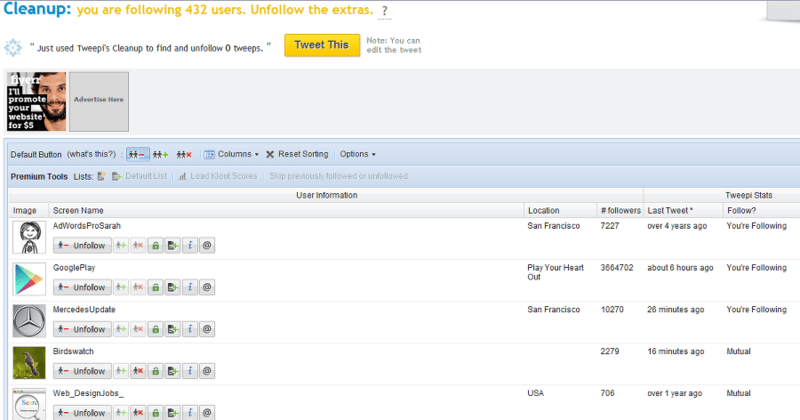 Below that, there is list of those inactive twitter accounts along with an option to unfollow them. The main thing to discuss about this tool is that it sorts the user’s account distinctly and precisely, without creating any confusion, provided there are varieties of categories in which it can be viewed and sorted. This was about just a single option. There are many interesting sections to go through and well organize your twitter account. Tweepi helps you to cleanup those whom you follow and also those who are follow you. It has an attractive layout and user-friendly interface, and the management of twitter account is done on basis of categories shown on their homepage. For instance, click on the cleanup the inactives option. The list of inactive users is then displayed. Alongside, there are various interesting buttons that have their own functionality of unfollow, safelist, tweet, etc. You can carry out your task comfortably! 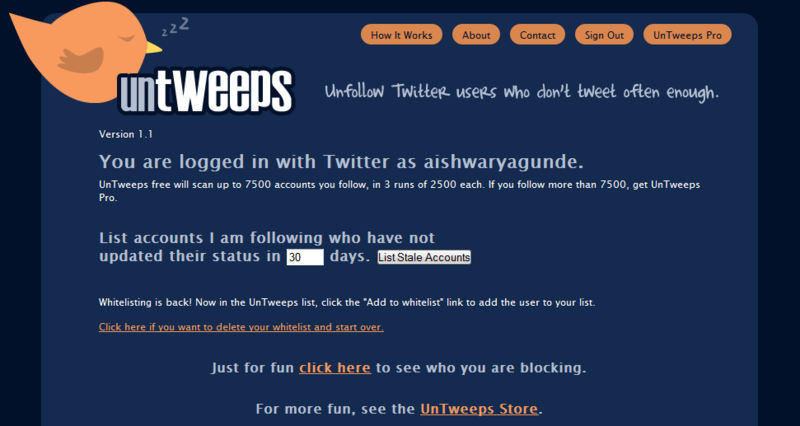 The name itself suggests that this tool aids the twitter users to unfollow the inactive users. It ensures you are with right and effective company even in your virtual world. This tool not only aids you find and unfollow the inactive users, but also guides you to get featured and gain followers. It finds perfect, targeted followers for you. It displays how many fans you have so that you can follow them back and interact with them. It even manages your Whitelist and Blacklist along with Non-Followers list. UnTweeps explains you in one line as to what it is built for. It has got a very simple interface. As soon as you login, you are asked to enter the number of days you want to check from, which will list out the twitter accounts that have not updated their status since the number of days you mentioned (see in the image below). Next, the twitter stale list appears; you just have to select the checkbox to unfollow. The things get done pretty quickly here! The main objective of all these tools is to keep its users in an effective influence rather than those inactive and namesake twitter users. All these tools organize your twitter account well considering every small aspect and moreover, provide the Pro versions in reasonable amount to get additional features and options. Thus, why not opt a tool and ease the account management? Share your experiences and views with us by commenting below. Twitter is one of the most popular Social Networking site to drive more traffic to our blog. We need to utilize Twitter properly using some tools and manually. 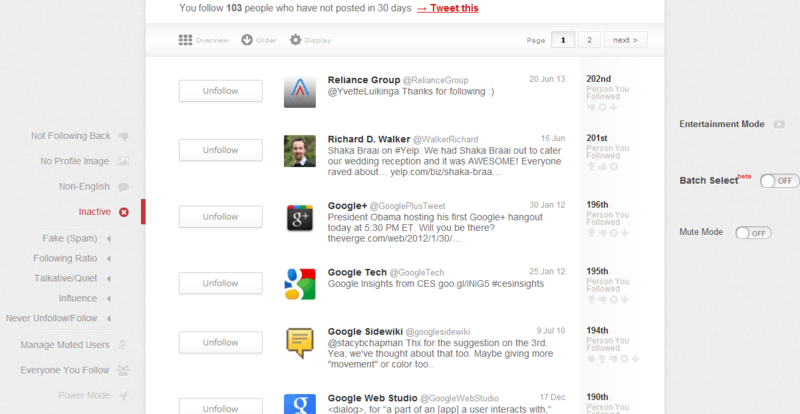 You mentioned here some great tools that are really helpful to get more active followers. I am using JustUnfollow to do this. 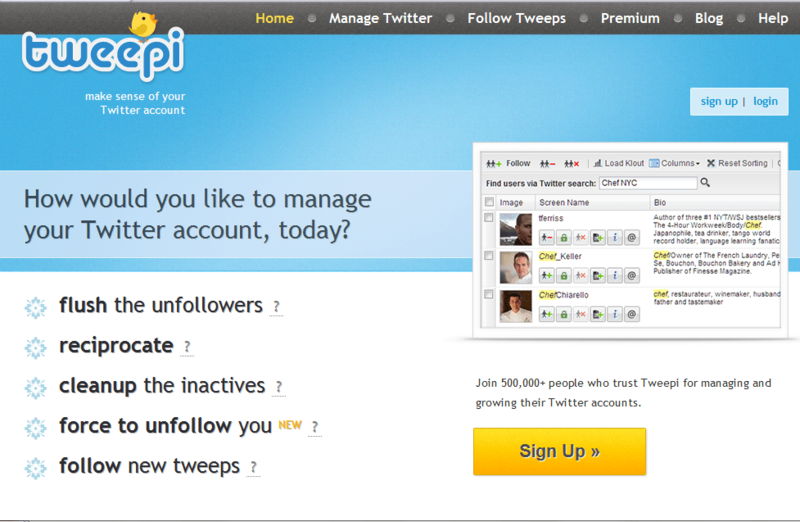 As it has been really good in helping me unfollow inactive users, I don’t think I will try some other tools. However thanks for sharing this post. I will surely use it as a reference in the future! I always use JustUnfollow to unfollow those who are not active in Twitter but I didn’t know Untweeps so I will check it out. This is really cool post. I would be able to get rid of the inactive users. My twitter account will get better. This article was really helpful and I am also going to use it as a reference in future. 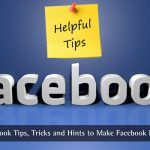 To get the most out of our blog posts social networks can help us until we are not having junk on it. FriendFollow.com is an other option. We can flush all non-followers at a time. Great article, I will start monitoring effectively my twitter account from now. I will always recommend JustUnfollow. It’s a very useful tool for twitter users. I personally use this tool and very much satisfied with it. I am trying to drive traffic to my blog from last few weeks. But I haven’t got much.But since I followed your article I just got a hike in the traffic, thanks for helping me.